I was really excited when one of our larger MAC stores got in some of the Illustrated collection (quite surprising the stand alone stores did not get these in). They did not receive the full collection, but I did manage to scoop up one of the Julie Verhoeven All Over Brush sets. I think Nordtstrom’s had these exclusively for their anniversary sale and then by some miracle we seemed to have gotten them? There are a number of reasons why I was thrilled with my purchase. The box itself is a collector’s piece. Beautiful grained paper with the beautiful Picasso-esque design emblazoned on it. I am still considering what I can use it for as I loathe to throw it away. 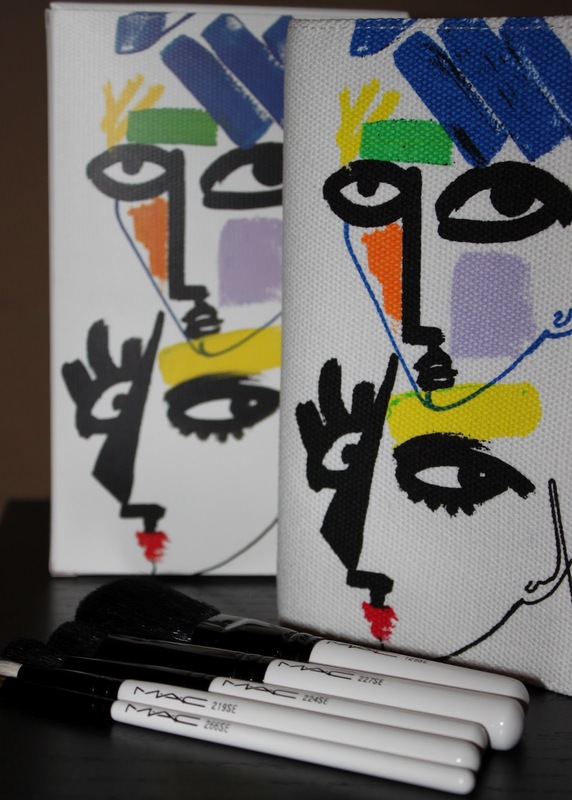 The brushes are encased in a canvas case which has the same bright modern print on it. It is a perfect size to pop into your bag for travel. It is held closed by a blue tie. The inside is bright and bold. There is a brush protector flap to protect this concise, well-edited collection of brushes.